I HELP PENSIONERS avoid bill shock with their mobile phones and it often means keeping them off mobile data plans. This runs counter to the Irish Minister for Communications' plan to move all of Ireland online. As utopian as a totally connected lifestyle seems, it always involves costs that cut into the fixed income of a pensioner. I am trying to show the pensioners in our family circle ways of ruthlessly controlling data services. The process is made easier with Symbian, the operating system used by the grandparents. 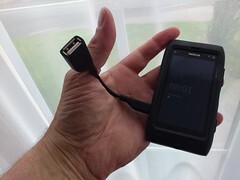 Nokia's venerable OS can force data connections only through wifi, so we are testing an old Nokia E7 in local hotspots. Because we don't use cloud services like Snapfish, it has become more difficult to extract photos from the phone for printing in kiosks. Most phones don't have removable storage media. Fortunately Symbian recognizes file systems so when I plug a standard USB key into the phone's adapter cable, the grandparents can save their photos onto a key for printing. We will test this "transfer to USB thumb drive" routine during a practical session next weekend. I haven't been able to sort put a similar solution with Windows Phone or iOS. Posted via Typepad's iOS app using O2 Hotshot service.